Jet-lag update.....I think I am pretty much on schedule! This is a travel day to Xi'an, so we spent time packing, had breakfast and then our driver and guide took us to the airport. We arrived in Xi'an a couple hours later and have really encountered our first disappointment. SMOG (Yes, that is the sun!). We have heard and read about the smog problem in China, but you have to experience it to realize how bad it is. As the afternoon progressed it became thicker so that at times visibility was only two-three blocks. Once I looked up and could see the sun as if looking through smoked glass. We asked our driver about it and he said it is caused primarily by the coal used to heat, although they have other fuel sources, they use coal because coal is a product of their area. In September the city begins heating the hot water and it is done with coal. In November they will use the coal to heat the home so it will probably be worse. After checking into the hotel we jumped back into the car and our driver took us to the Shanxi History Museum and the Great Goose Pagoda and Temple. The museum contained artifacts as far back as the 17th Century BC to the early 20th Century. A very impressive collection. At the Great Goose pagoda we walked around and took pictures and then returned to the hotel to clean up for dinner. For me personally this dinner has to be the highlight of the trip. 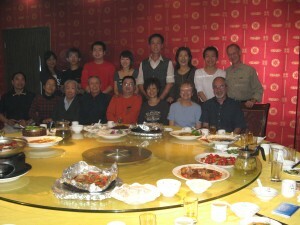 My cousin's wife has family here in Xi'an and wanted us to all go out to dinner with her family. We met at her aunt and uncle's home where we were treated as honored guests. They live in a two room with kitchen apartment where every square centimeter is utilized. Her relatives from Chengdu were also in town for the holiday and we met them. A couple of them spoke some English and we learned a little about what the younger people were doing. One son is in graduate school studying Mechanical Engineering. A daughter is an administrator at an Adult School and a third young man is studying Civil Engineering. The parents from Chengdu work with another sister in real estate. The bottom line is that this is a very close and warm, welcoming family and we were very touched by their openness and hospitality. The aunt and uncle and daughter and her husband live in a set of apartments that was referred to as a compound. It is a figurative term. All the workers in a factory nearby all live together...in the compound. In some cases the factory subsidizes the rent based on how long you have worked for the factory. It has been a very hard life for all of these people and yet they smile! We then walked several blocks to a neighborhood restaurant. On the way it was interesting to see the looks on the faces of the locals as the 'old foreigners' walked down the street. We got to the restaurant and walked up to a large room where there was one huge table (in the round with a huge turntable in the middle for placement of the food) set for sixteen people. After the food was ordered everyone sat down and then the food stated coming in and coming in and ... What a feast. Every thing you could imagine. Today I am putting a picture of everything we had. I have lost count.... From time to time someone would rise and make a toast. Some of the food was HOT. The relatives from Chengdu (and everyone else) were entertained by the smoke coming out of my ears. I couldn't even talk for a bit...not that I had anything to say anyway. By the way, Carol and I have gotten along fairly well with the chopsticks. After a session of group pictures we said our goodbyes, leaving with an invitation to visit Chengdu and two bags of fruit, one of them persimmons, which are a great, sweet, juicy fruit! Shanxi Lishi Bowuguan (Shanxi History Museum) If you visit one museum in China, make it this one, for its unrivalled collection of treasures. As you enter, start with the hall on the left, pull on a jacket to brave the fierce air-conditioning, and ignore the man who tries to drag you to his display of "original art." 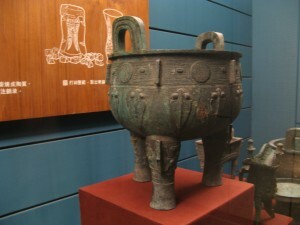 Items are displayed chronologically, starting with the Shang dynasty (ca. 17th c.-11th c. B.C.) and the Zhou dynasty (ca. 11th c.-221 B.C.) 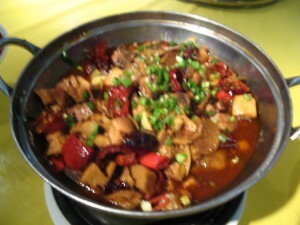 on the ground floor, including items that speak to eating, drinking, and merriment in the Western Zhou (ca. 11th c.-771 B.C.). Things take a martial turn as you enter the Qin dynasty (221-206 B.C. ): Aside from the bronze swords and rusting iron weapons (which gave the Qin a decisive military edge), a striking exhibit is a tiger-shaped tally covered in characters (duhu fu) which gave its owner, one General Du, imperial authorization to mobilize over 50 soldiers at will. As you move on to the Tang dynasty (618-907), the influence of Buddhist art from the Silk Routes becomes apparent -- carvings are more sophisticated, and bright colors are introduced. Perhaps the most startling exhibits are the frescoes (bihua) relocated from the Tang tumuli around Xi'an. A depiction of ladies-in-waiting (gongnu tu) shows nine women carrying the tools of their trade -- candelabras, fans, cloth bundles, powder boxes, even fly swatters. Two of them are dressed in male clothing. Another fresco (ma qiu tu) shows noblemen enjoying the newly imported game of polo. Ceramic tomb guardians point to a lively trade with the outside world -- there's a trader from Africa and a fanciful depiction of a man on horseback battling a leopard.